“The Spirit itself beareth witness with our spirit, that we are the children of God” (Rom. 8:16). How can you know that Heavenly Father loves you? One way our earthly parents show their love is by providing food and shelter for us. They also teach us to choose the right. Our Heavenly Father has provided us with many things that remind us of His love for us every day﻿—the beautiful earth, the scriptures, the living prophets, and our families. Best of all, He sent Jesus Christ. Because of Jesus Christ, we can return to live with Heavenly Father if we choose the right. President Gordon B. Hinckley has taught that we can show our love to our Heavenly Father as we speak to Him in prayer and keep His commandments. When we do this, President Hinckley promises: “He will watch over you and guide you and protect you. He will bless you in your schoolwork and in your Primary. He will bless you in your home, and you will be a better boy or girl. … Never forget, my dear young friends, that you really are a child of God who has inherited something of His divine nature, one whom He loves and desires to help and bless” (“You Are a Child of God,” Liahona and Ensign, May 2003, 119; Friend, May 2003, 6). 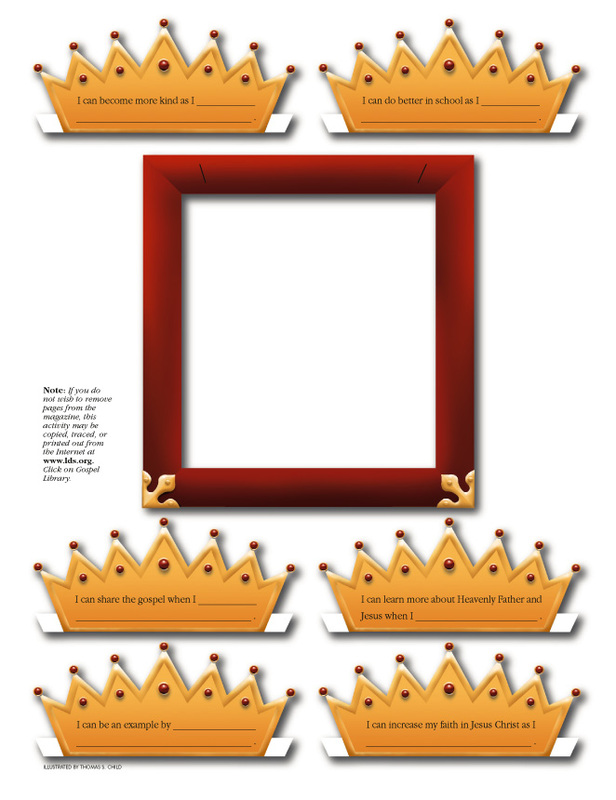 Make a crown frame to remind you that you are a child of God. Remove page F15, and attach it to heavy paper. In the frame, attach a mirror or a picture of yourself. Cut out the frame, the slits on the frame, and the crown cutouts. Fill in the blanks on the crown cutouts. Every month attach a new crown to your frame by inserting the tabs on the crown into the slits on the frame. I can become more kind as I ____________ . I can do better in school as I ____________ . I can share the gospel when I ____________ . I can learn more about Heavenly Father and Jesus when I ____________ . I can be an example by ____________ . I can increase my faith in Jesus Christ as I _____________ . Note: If you do not wish to remove pages from the magazine, this activity may be copied, traced, or printed out from the Internet at www.lds.org. For English, click on “Gospel Library.” For other languages, click on the world map. Help the children memorize the following lines from the Faith in God guidebook (inside front cover): “I know Heavenly Father loves me, and I love Him. I can pray to Heavenly Father anytime, anywhere. I am trying to remember and follow Jesus Christ.” Select a scripture story on prayer﻿—for example, Nephi with his brothers on the ship (see 1 Ne. 18) or Daniel in the lions’ den (see Dan. 6). After the children role-play this story using simple costumes or name tags, discuss the principle of prayer. Repeat with the children the memorized lines. Have each class quietly discuss favorite scripture stories about prayer. Let each class choose a child to tell a story to the whole Primary. Explain that making choices is an important part of our life on earth. Our right to choose is called agency (agency or moral agency﻿—not free agency). As we use our agency to choose the right, we are following Jesus Christ and can return to live with Him and Heavenly Father. The scriptures help us choose the right. Post a picture of Jesus with a 10-step path leading to Him and a paper child at the end of the path. Give each class a paper in the shape of a road sign with one of the following scripture references printed on it: Ex. 20:8; Matt. 19:18; 2 Ne. 32:9; Mosiah 13:20; 3 Ne. 12:34; D&C 42:21; D&C 42:27; D&C 51:9; D&C 89:7–8; D&C 119:4. (Some classes may receive more than one paper.) Have the classes look up the references and write on the paper the principle we are to obey. Post the “road signs.” Prepare case studies that require the children to make a decision to obey one of the “road signs”﻿—for example, “You hear someone talking unkindly about a friend. What do you do?” Let the children respond, and then move the paper child along the path toward the picture of Christ.